In 1915 Emmy Noether discovered an important connection between the symmetries of a system and its conserved quantities. 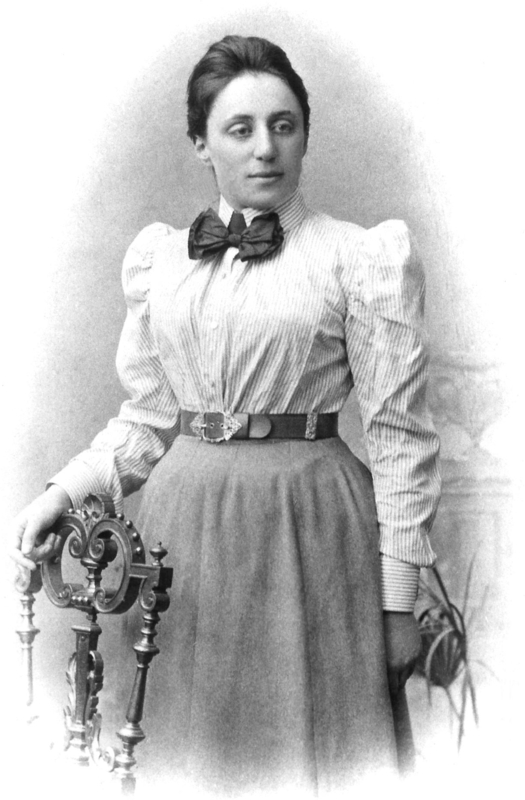 Her result has become a staple of modern physics and is known as Noether’s theorem. • John Baez and Brendan Fong, A Noether theorem for stochastic mechanics, J. Math. Phys. 54:013301 (2013). One goal of the network theory series here on Azimuth has been to merge ideas appearing in quantum theory with other disciplines. John and Brendan proved their stochastic version of Noether’s theorem by exploiting ‘stochastic mechanics’ which was formulated in the network theory series to mathematically resemble quantum theory. Their result, which we will outline below, was different than what would be expected in quantum theory, so it is interesting to try to figure out why. Recently Jacob Biamonte, Mauro Faccin and myself have been working to try to get to the bottom of these differences. What we’ve done is prove a version of Noether’s theorem for Dirichlet operators. As you may recall from Parts 16 and 20 of the network theory series, these are the operators that generate both stochastic and quantum processes. In the language of the series, they lie in the intersection of stochastic and quantum mechanics. So, they are a subclass of the infinitesimal stochastic operators considered in John and Brendan’s work. The extra structure of Dirichlet operators—compared with the wider class of infinitesimal stochastic operators—provided a handle for us to dig a little deeper into understanding the intersection of these two theories. By the end of this article, astute readers will be able to prove that Dirichlet operators generate doubly stochastic processes. I’ll assume you’re familiar with quantum theory, but let’s start with a few reminders. In this case we say is a ‘conserved quantity’. The fact that we have two equivalent conditions for this is a quantum version of Noether’s theorem! We want this always be a probability distribution. To ensure that this is so, the Hamiltonian must be infinitesimal stochastic: that is, a real-valued matrix where the off-diagonal entries are nonnegative and the entries of each column sum to zero. It no longer needs to be self-adjoint! When is infinitesimal stochastic, the operators map the set of probability distributions to itself whenever and we call this family of operators a continuous-time Markov process, or more precisely a Markov semigroup. So it’s a bit subtle, but symmetries and conserved quantities have a rather different relationship than they do in quantum theory. In summary, by restricting ourselves to the intersection of quantum and stochastic generators, we have found a version of Noether’s theorem for stochastic mechanics that looks formally just like the quantum version! However, this simplification comes at a cost. We find that the only observables whose expected value remains constant with time are those of the very restricted type described above, where the observable has the same value in every state in a connected component. Puzzle 1. Suppose that also so that is a Dirichlet operator and hence generates a 1-parameter unitary group. Show that the indegree and outdegree of any node of our graph must be equal. Graphs with this property are called balanced. and all the off-diagonal entries of are nonnegative. Show the converse is also true. Puzzle 3. Prove that any doubly stochastic Markov semigroup is of the form where is the graph Laplacian of a balanced graph. This is a stochastic version of the Ehrenfest theorem. This entry was posted on Saturday, May 3rd, 2014 at 4:38 pm and is filed under mathematics, networks, physics, probability. You can follow any responses to this entry through the RSS 2.0 feed. You can leave a response, or trackback from your own site. She had two theorems about symmetries of a system. Best not to perpetuate the myth that there is THE Noether Theorem. • Quantum theory and division algebras. arguing that we should think of all three flavors of quantum mechanics as part of a unified structure. The math here gets quite interesting. The Jordan–Wigner–von Neumann classification of formally real Jordan algebras plays an important role (I explain that in my paper), and the groups O(1,n) show up in this theorem too, though in a way that’s still mysterious. All these flavors of quantum mechanics are quite different from stochastic mechanics. It looks exactly like the quantum version, but all the expressions mean something a bit different! And here’s an interesting twist. At least this is true with the definition we’re currently using of observables: diagonal matrices. At first glance this suggests maybe we should generalize our definition of observable. But actually I think the concepts of observable (like ) and symmetry generator (like ) become distinct in stochastic mechanics. I don’t think there’s an observable deserving the name ‘energy’ associated to the symmetry generator And there may even be other concepts, waiting to be named and understood! What sort of thing is for example? It’s not an observable according to our current defintion (a diagonal matrix), nor is it a symmetry generator (an infinitesimal stochastic matrix). Yet it’s still important—we need to take its expected value! It seems to be something new. It may be too simple, but in classical mechanics exist Poisson bracket that give invariants, so that this can be an invariant in stochastical mechanics (if the matrix zero is an observable). I am thinking, that if this is true, then two invariants and given another invariant and so on. So, that’s nice. The problem I’m concerned with is that in stochastic mechanics it’s tempting to say is an observable iff it’s diagonal in the standard basis. This is based on the idea that in probability theory, an observable is a function on the probability measure space. is not an observable according to this definition! So, we don’t get a ‘Heisenberg picture’. But if we want to change our definition of ‘observable’ in stochastic mechanics, the question becomes: what definition should we use? One option is to say any operator counts as an observable. However, then it’s possible for two different observables to have the same expected value in every state. Maybe this is okay, but it goes against the standard philosophy about observables. Also, if we expand our definition of observable to include non-diagonal matrices, then observables don’t commute. I already said this… but now I want to point out that this introduces noncommuting observables, normally considered a feature of quantum theory, into probability theory! Maybe that’s a good thing. But it’s worth thinking about. I’ve thought about this a bit, but because this ‘square root map’ from probability distributions to wavefunctions is nonlinear, while time evolution in both quantum and stochastic mechanics is linear, I don’t see how to use it to turn stochastic systems into quantum ones. The Quantum Techniques for Stochastic Mechanics book is based on another idea, which is that it might be interesting to copy some ideas from quantum mechanics to stochastic mechanics while deliberately ignoring the fact that the usual relation between probability distributions and amplitudes is nonlinear. While this is weird, it seems to work. Wow, it seems like the matrix in both quantum and stochastic accounts is information being created and information being destroyed. One vector is destroyed by the operation of the matrix, and from that operation either a same or different vector is created. Are there conservation laws at work here? I’m in Erlangen, where the great German mathematician Emmy Noether was born in 1882. She was the daughter of the well-known mathematician Max Noether—but as a woman, she was only allowed to audit courses at the university here. Somehow she finished a PhD thesis in 1907. She then worked here without pay for 7 years, since women were excluded from academic jobs. This is not mathematics; this is theology. Noether did her thesis, On Complete Systems of Invariants for Ternary Biquadratic Forms, in the style of Gordan’s work. It was well received, but she later said it was “crap”. While working without pay, she learned Hilbert’s ideas and started revolutionizing the subject of algebra. After all, we are a university, not a bath house. It took years for her to actually get paid, but she started working at Göttingen and soon proved the theorem physicists remember her for, relating symmetries and conservation laws. They call it Noether’s Theorem. certainly one of the most important mathematical theorems ever proved in guiding the development of modern physics, possibly on a par with the Pythagorean theorem. Her theorem applies to classical mechanics and classical field theory, but there’s also a quantum version, and more recently Brendan Fong and I proved a ‘stochastic’ version, which applies to random processes. The stochastic version is weirdly different from the quantum version, but Ville Bergholm has just written a nice article discussing this issue, and some results he discovered with Jacob Biamonte and Mauro Faccin. Check it out! Emmy Noether finally started getting a salary in 1923, sixteen years after finishing her thesis. If anyone asks why there are fewer famous women mathematicians than men, consider pointing this out! Noether did extraordinary work until 1933, when the Nazis kicked her out of the University of Göttingen. She wound up in Bryn Mawr College, a women’s college near Philadelphia. She died of complications from surgery in 1935. In 1921 she stated the general definition of ‘ring’ and ‘ideal’, and proved that in a ring where every increasing sequence of ideals stops growing after finitely many steps, every ideal has finitely many generators. Such rings are now called Noetherian. In 1927 she gave a massive generalization of the fundamental theorem of arithmetic, about unique factorization into primes. She characterized commutative rings in which the ideals have unique factorization into prime ideals as the integral domains that are Noetherian, 0- or 1-dimensional, and integrally closed in their quotient fields. Sorry—this sounds technical, and it is! But everyone who studies modern number theory takes this result as basic: such rings are now called Dedekind domains, but Noether discovered them. Even more important than either of these massive results are the beautifully simple ‘Noether isomorphism theorems’ that everyone learns near the start of a course on group theory. And perhaps even more important was her discovery of ‘homology groups’ while attending lectures by the famous topologists Alexandrov and Hopf. Other people would have made a whole career out of this discovery, which utterly revolutionized topology. But she only gave it a tiny mention in one of her works on group theory! She was truly a fountain of new ideas. I now have an office in the Emmy-Noether-Zentrum für Algebra at the university in Erlangen. During her first years teaching at Göttingen she did not have an official position and was not paid; her family paid for her room and board and supported her academic work. Her lectures often were advertised under Hilbert’s name, and Noether would provide “assistance”. In 1880 he married Ida Amalia Kaufmann, the daughter of another wealthy Jewish merchant family. The interesting question here is of course, whether her parents paid for her for the reason of loving paternal care or whether they felt the moral obligation to pay for their daughter or whether they actively wanted to support her in her rather “crazy” fight for equal rights. I write “crazy” because in particular by looking at her life I am not sure whether one can even speak about “women’s liberation” in this context . It’s indeed interesting to wonder what Emmy Noether’s parents thought about her, and what she thought about her own situation. I don’t know what’s recorded about this—I’ve never read a detailed biography of her. Clearly she thought about these issues, e.g. after she visited the Institute for Advanced Studies at Princeton she wrote that she was not welcome at this “men’s university, where nothing female is admitted”. they actively wanted to support her in her rather “crazy” fight for equal rights. I would like to add that her main motivation for working were probably the subjects she was working on, that is she probably found that it was important to do this work and the concrete environment she was working in was eventually only of secondary importance. So I regard the fact that she was teaching and actively contributing as a “fight for her rights”. In particular she could have thought that at one point that this apparent imbalance of treatment is noticed and that she would get more support. It is however not clear to me how many collegues were convinced of the importance of her work at that time and if they were, why they wouldn’t try to change the way things were. May be because she was not making enough fuzz and trouble? But in fact in the end she was at least supported in fleeing from the Nazi’s. Clearly she thought about these issues, e.g. after she visited the Institute for Advanced Studies at Princeton she wrote that she was not welcome at this “men’s university, where nothing female is admitted”. I find it problematic to sort out typical “female” or “male” features that is on average I think there are differences, but the distribution is often rather individual and similar to racial differences a lot of differences, if not most, are due to cultural differences. But yes as said on average there seem to be differences. So if there are way more males that females in an institution there may be a noticable dfifference in atmosphere, but that depends a bit also on what kind of males/females. I went from an all girls school to almost basically all boys math-physics school and I found the atmossphere quite different. I think I understand what she could have meant. It’s indeed interesting to wonder what Emmy Noether’s parents thought about her, and what she thought about her own situation. I couldn’t find any personal recollections of her or her parents. That seems her writings seem to have been mostly of a mathematical nature. Is there a connection with time reversibility here? A stationary Markov chain is reversible if and only if the matrix of transition probabilities can be written as the product of a symmetric and a diagonal matrix. So says Exercise 4, page 10 of Frank Kelly’s book Reversibility and Stochastic Networks. If exp(tH) has this property for all t, does that mean H does? I was thinking that if H=DS where D is diagonal and S symmetric, and assuming D is invertible, you’d have OH=HO iff ODS=DSO iff DOS=DSO iff OS=SO. I love thinking about these things but it always takes me a while to remember all the relationships between reversible Markov chains, doubly stochastic operators, Dirichlet operators, etc. So, I’ll hope that Jacob Biamonte or Ville Bergholm can field your question! Here in Torino, we have Jacob Turner from Penn State visiting for a while and in collaboration with his PhD advisor, Jason Morton we’ve been thinking a lot these days about time-reversal symmetry in quantum mechanics. We have thought about how this relates to the more familiar notions of reversing Markov processes. I want to think more about what you’re saying. This definition is relevant to this post since the following are all equivalent. time-reversal symmetry breaking. (Full disclosure, as John knows, I’m supposed to be making a post about how some of the ideas in the Network Theory Series can be used to study infectious disease propagation—applied to a long chain of rabbits. This is a missing chapter from our course notes/book). Reblogged this on Homepage of Rene Garcia. The way I learned about Noether’s theorem was in quantum field theory, when studying Lagrangian symmetries and conserved currents. Also, I know that in Lie group theory there is another formulation of Noether’s in terms of the moment map. Is there something similar to a Lagrangian formulation for stochastic mechanics? There should also be a version relating quantum field theory to stochastic field theory, but if you want to study this I suggest starting with particles instead of fields. • A. Barros and D. Torres, Teorema de Noether no cálculo das variacoes estocástico, available as arXiv:1208.5529. • J. Cresson and S. Darses, Plongement stochastique des systémes lagrangiens, C. R. Math. Acad. Sci. Paris 342 (2006), 333–336. Also available as arXiv:math/0510655. This is a small, maybe trivial, point but it’s something that I have been thinking about recently in regard to my own research. It seems to me that your master equation has the wrong sign. As I said, a small point and probably doesn’t change anything but let me ask anyway. and this suggests that either the right-hand side is or , where is a Lagrangian-like operator. Personally, I think the former makes more sense. If you want to be not only infinitesimal stochastic but self-adjoint, it’s common in quantum mechanics to assume is a positive self-adjoint operator, e.g. It’s all just a matter of different conventions; the physics is the same either way.